The conveyancing market roared into 2018 with its strongest quarter in nearly two years as the industry bounced back after a disappointing end to 2017. The Q1 2018 edition of Search Acumen’s Conveyancing Market Tracker reveals that total transaction volumes over the three-month period reached 271,546. This was 12% higher than Q4 2017 (241,666), and the highest number recorded since Q2 2016 (286,485) – a strong response after the Q4 2017 Market Tracker which revealed that, over the whole of 2017, the market saw the first annual drop in transaction volumes in six years. 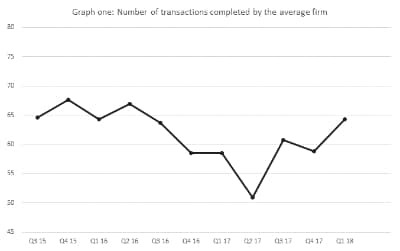 While this big boost in conveyancing activity did not markedly increase the number of active firms in the market (up only 1%), existing firms were able to take on more business. The average firm processed 64 transactions in Q1, up more than 8% from the 59 in Q1 2017. This resulted in the busiest quarter for conveyancing firms since Q3 2016. Broadly, the market continues to favour larger conveyancing firms that transact a significant number of cases each month. Those firms that only transact between 5 and 10 cases a month have continued to decline, with their business down 10% since 2014. Conversely, those firms that transact between 200 and 500 cases have seen business increase by 50% over the last four years. Search Acumen’s analysis of Land Registry transaction data previously revealed that in 2017, the challenger conveyancers took full advantage of stasis amongst the largest firms. This trend has continued into 2018 with a considerable uptick in firms registering between 200 and 500 transactions each month – which grew 34% year-on-year (YoY). In Q1 2018, the top five ranking conveyancing firms continued to see pressure growing from the challengers beneath them. Activity levels among the top five ranking firms increased 9% YoY, but it was the firms between 51st and 100th who realised the strongest gains in the market, with activity up 16% since Q1 2017. Comparing different types of transactions, Transfer of Part transactions shot up 57% QoQ (26,120 to 41,101), and 25% YoY (from 32,999). First Registrations saw the biggest annual jump in activity, up 40% on last year’s figures (from 5,658 to 7,895). Meanwhile, the only category to suffer a drop in volumes compared with Q1 2017 was Dispositionary First Lease, which dropped 16% (from 911 to 768). Meanwhile, Dealings were up 8% yearly from 206,169 to 221,782. While business is up across the board, the share of business amongst the large and small conveyancers has remained static, despite a large shift in challenger firms’ activity. The top 1,000 conveyancing firms held 75% of the market share in Q1 2018, and the top five firms commanded just under 6% of the market – figures entirely in line with 2017’s market share numbers. “It’s great to see that despite a reportedly stagnant housing market and headlines predicting a housing bust, conveyancers have bounced back from a disappointing end to 2017. “The story of 2017 for the conveyancing market was the continued rise of the challengers – those firms operating just below the biggest conveyancers – and that seems to have continued into 2018. It is perhaps the fact that smaller firms can be more nimble to market movements and more quickly embrace technology that has allowed them to take advantage of increasing transactions. 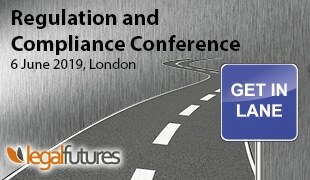 The larger firms need to ensure they are looking beyond the next quarter and considering what’s next for conveyancing to remain at the top of the pack. “More generally, with a dearth of new entrants to the market, it’s been the job of all conveyancers to do more with less, and they are seemingly up to that challenge. But, if these trends persist, firms must ensure they operate with absolute efficiency and embrace technology to create a transparent, productive proposition that can help conveyancers offer their clients more.